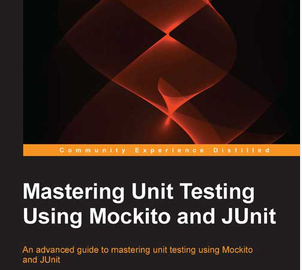 I was asked by Packt Publishing to write a review blog post about the new book Mastering Unit Testing Using Mockito and JUnit by Sujoy Acharya (released in Jun 2014). As I am passionate about all topics around testing or continuous development, I got exited. Nice side effect of this is that I could read this book for free ;). Book is 314 pages long. Divided into 10 chapters. Guides reader how to create simple project in Eclipse. Leads him through JUnit features. It starts with basic fundamentals. Later in the chapter are described advanced parts of JUnit API. Some of these parts of the API should be used rarely or not at all (e.g. test methods ordering). This would be worth mentioning for beginners. I wasn’t very excited because I am TestNG user. If you ever wrote some unit tests you probably would want to skip this chapter. Surprising for me was comparison of JUnit 4 @Before annotation with JUnit 3 setUp(). JUnit 4 is already 8 years old. Elaborates about Continuous Integration. Also provides basic information about Gradle, Maven and Ant. Demonstrates very simple configurations of each build tool and how they run tests. Lastly touches simple Jenkins integration with each mentioned tool. Shame that configuration of examples across the book weren’t driven by any of this build tools. Brief explanation of theory behind faking dependencies of testing object. It also contains examples of each type (without usage of any testing framework so far). Demonstrates Mockito syntax on examples. It goes through basic and also advanced Mockito features. At the end of the chapter is mentioned BDD (Behavioral driven development) style of testing. The only disturbing moment was manual inclusion of dependencies in example project configuration. Build tools were discussed in Chaper 2. Author explains what code coverage means. After that shows some ways how to measure code coverage from Eclipse. I was surprised that he still accepts Cobertura as relevant tool, because Cobertura is dead project now. Last version was working only for Java 6. Java 6 was marked as “End of life” more that a year ago. That is why integration examples of Cobertura with Ant and Maven aren’t very useful. Examples how to integrate them with JaCoCo would be much more appropriate. I integrated JaCoCo with Maven in the past. It’s definitely doable. EDIT: Cobertura is again under active development and is working for Java 7 now. Than it introduces SonarQube and its integration with mentioned build tools. It is very handy tool for monitoring technical depth on the project. But Spring MVC examples with Spring Test’s MockMvc library are missing. Examples in this chapter contain only plain Mockito + JUnit libraries. Readers should definitely take a look at MockMvc capabilities, because they are much more handier than explained approach. This time author focuses on DAO layer. My personal opinion is that mocking Connetion or PreparedStatement in tests isn’t quite right. You can have test passing, but when you execute SQL statement against DB it can fail on some SQL error. I prefer to have integration tests for DAO layer. Discusses constructs known as testability killers and some approaches how to solve them. I also discussed this topic in blog post series. I am glad that author doesn’t suggest usage of PowerMock. Rather takes the path of changing production code to enhance testability. Totally agree. Finally it shows example of TDD style of programming. Shame that this is the only example in the book where test is introduced before production code. So all other examples doesn’t follow TDD. This chapter dives into some common pitfalls reader can fall during writing the tests. Such advices are always good to keep in mind. “Mastering Unit Testing Using Mockito and JUnit” book declares that was written for advanced to novice software testers and developers who use Mockito and JUnit framework. I would say that is only for beginners. It is mainly because book is covering wide range of topics around testing and its automation. There isn’t enough place dive deeply. Positive is covering nearly all aspects of professional unit testing. So it is very good start for developers that are willing to explore benefits of automated feedback loop. Author takes approach of hands on examples, so it is much better to read it next to the computer.